Choosing new flooring can be challenging. Regardless of the floors you select, you want a product that is beautiful, easy to clean, and cost-effective. You can’t go wrong with ceramic tile flooring. Come to our flooring store to speak with one of our experts about this excellent flooring option. Ceramic tile is one of many flooring types that provide timeless elegance to a home or business, but ceramic tile floor offers a multitude of benefits that makes this an excellent choice for you. Ceramic usually costs the least of all other tile floors, such as porcelain and stone. So, if budget is a consideration for you, then this floor covering has the advantage. The composition of ceramic makes this flooring option an excellent selling point as well. This type of tile is made from clay that has been heated to extremely high temperatures in a kiln. It is strong and resistant to fire, frost, and even the passage of time. Another great feature of ceramic tile flooring installation is that it resists water and liquids, which makes it stain resistant. The professionals on our staff have the necessary training and years of experience to do an exceptional job. We install tile according to the best practices in the industry and follow the manufacturer’s recommendations. Tile can be tricky to work with, but with skill and knowledge, everything proceeds smoothly. Our installers carefully measure the room and cut the tiles so that they fit perfectly around the edges of the room. Precise measurements ensure that tile is not wasted. We begin by removing the old flooring and then preparing the subfloor. When the surface is clean, dry, and level, we apply mortar, place the individual tiles, and fill in the spaces between the tiles with grout. Besides defining the individual tiles, grout keeps the squares from touching and chipping. You can trust that we offer quality products and services in our flooring showroom. In addition, we give our customers this assurance in our Ultimate Confidence Guarantee. You can shop with confidence knowing that we carry only the best brand names of products and offer exceptional customer service that you need. We back up our products and services with warranties that are the most impressive in the business. Get creative with ceramic tile. We offer hundreds of choices in brand, color, size, and shape. Feel free to mix it up and add visual appeal to your flooring. If you’d like, our sales and design professionals help you create interesting patterns. How about edging the room with tile of a different color? What about using a pattern of tiles as the focal point of a room? 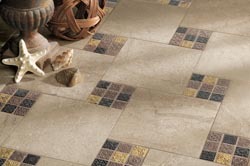 We have lots of ideas to give your home a custom look with ceramic tile flooring. Are you ready to pick out ceramic tile flooring for your home? Contact us today for information on brands, colors, sizes, and shapes. We proudly serve customers in Rocklin, California, including Lincoln, Loomis, Roseville, Granite Bay, and the surrounding area.